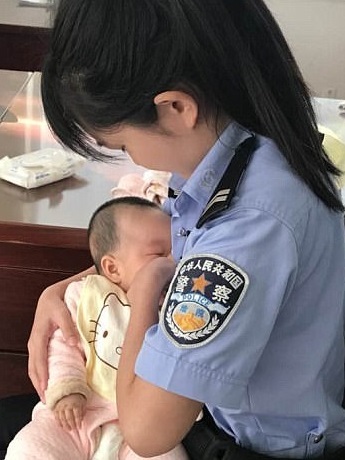 Hao Lina, a police officer in China, has melted the hearts of millions after breastfeeding the four-month-old baby of a suspect. The infant's mother was attending a trial and could not nurse her crying child. She had given permission to Ms Hao before letting her baby be fed. The baby's mother was charged with fraudulent fund-raising, illegally absorbing public deposit and crime concealment with 33 other people, according to the court. Ms Hao, a mother herself, said the baby had been left under her and her colleagues' care before its mother went for the trial. 'The baby wouldn't stop crying and we were all worried,' said Ms Hao. After gaining the permission of the baby's mother, Ms Hao found a quiet corner in the building and breastfed the baby. The baby's gender has not been revealed. The scene was captured by one of Ms Hao's colleagues.